(Nanowerk News) Synthetic biologists at Rice University have engineered gut bacteria capable of sensing colitis, an inflammation of the colon, in mice. The research points the way to new experiments for studying how gut bacteria and human hosts interact at a molecular level and could eventually lead to orally ingestible bacteria for monitoring gut health and disease. The research, published in a new study in Molecular Systems Biology ("Engineering bacterial thiosulfate and tetrathionate sensors for detecting gut inflammation"), involved a series of breakthroughs in the lab of Jeffrey Tabor, assistant professor of bioengineering and of biosciences at Rice, and key contributions from collaborators Robert Britton and Noah Shroyer at Baylor College of Medicine. 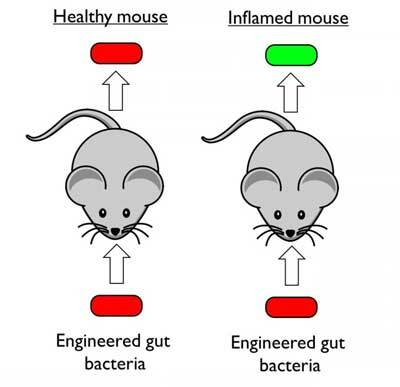 Tabor's team, including lead co-author and postdoctoral researcher Kristina Daeffler, identified the first genetically encoded sensor of a novel biomarker linked to inflammation, inserted the genes for the sensor into a well-studied gut bacterium and collaborated with Shroyer and Britton to use the engineered bacteria to detect colon inflammation in mice.